March is a strange time of year. I'm usually sad to see winter go. After this winter's prolonged cold spring can't come fast enough. Still, I have a hard time saying goodbye to winter. 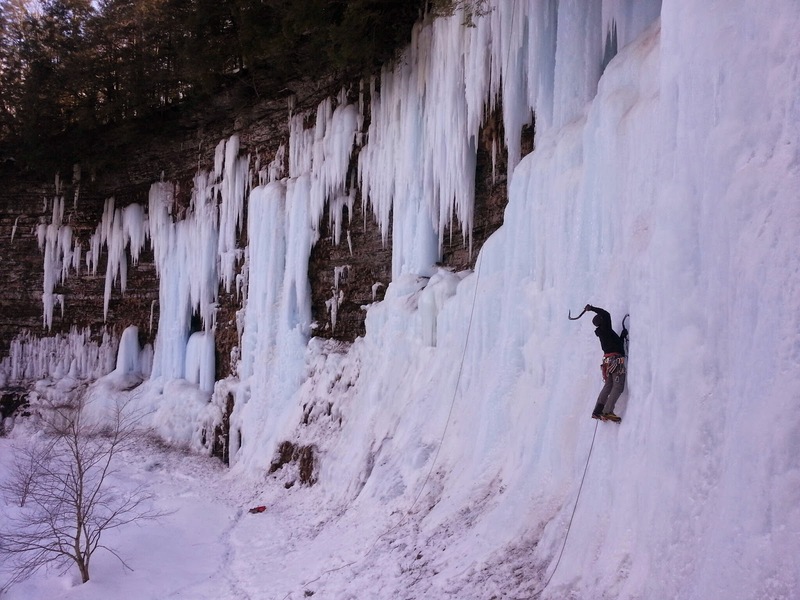 I've already told more than one friend that I was done ice climbing. I want to mountain bike, run and rock climb, and feel the warmth of the sun on my face as it climbs higher through the sky each spring day. After my trip to Newfoundland this year I wanted nothing more to do with the cold. I'd been wearing double boots all winter, and on that particular trip I wore a puffy jacket nearly all the time, except during hard leads. 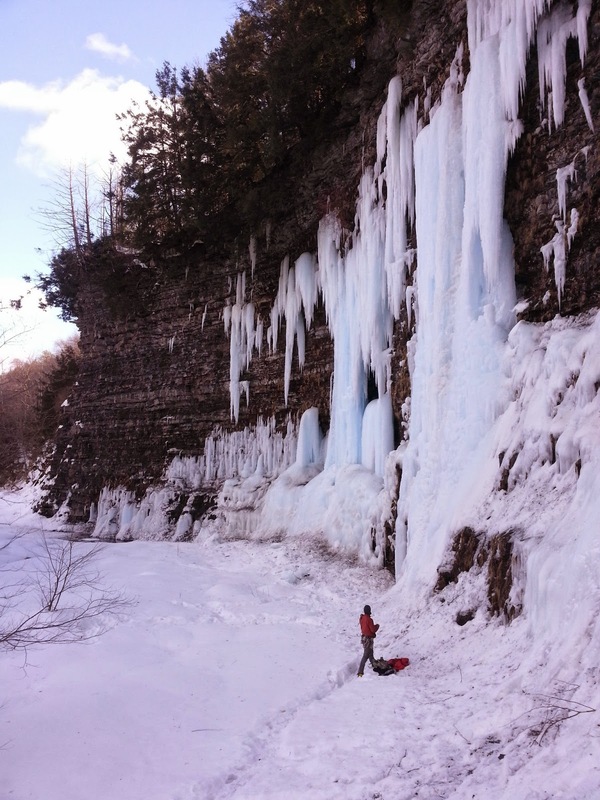 I pretty much wrote off ice climbing after visiting the Black Chasm last week. We found unexceptional conditions and a lot of delaminated ice. However, after seeing a few of Adam and Dirk Endres' photos of Salmon River from this past weekend on NEice, I decided I wasn't done yet. I emailed Chris Beauchamp, a regular partner of mine about it on Monday morning. He was sitting at his computer and his response was instant - we should go to Salmon River and climb. We'd been talking about going for some time, and this was the perfect opportunity. After ditching a car in Westfield, MA Tuesday morning we were on our way. Four hours of coffee and road food (junk) fueled our bee-line across the bowels of central New York. 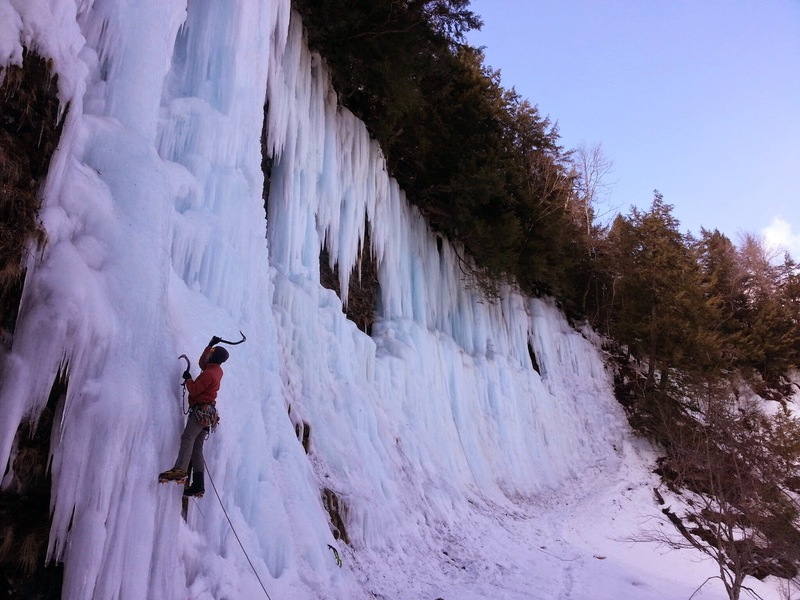 By 2 pm we were climbing, and despite warmer conditions we found quite a bit of good ice. My initial disappointment about the warm ice was soon forgotten as we stemmed, picked and slugged our way up beautiful steep pillars in this very unique amphitheater. The following morning we returned and climbed 3 more pitches before driving home. A cold night had firmed up the ice, and climbing harder routes with more challenging technical top-outs in the utterly horrible shale felt more doable. For me, the highlight was leading Salmonella - one of the harder pitches that actually felt safe this late in the season. I am glad I was finally able to visit this spot. It opened just as I was finishing my studies at St. Lawrence University in 2001 and I never went there. How I wish it had been open when I was a student there. I would have been a frequent visitor. I am looking forward to going back next season when the harder routes are in better shape.